Use protons, neutrons, and electrons to build elements. As the number of protons, neutrons, and electrons changes, information such as the name and symbol of the element, the Z, N, and A numbers, the electron dot diagram, and the group and period from the periodic table are shown. Each element is classified as a metal, metalloid, or nonmetal, and its state at room temperature is also given. This is a straightforward 1 page worksheet to introduce my grade 9 applied students to Gizmos and to teac... (more)h them about the basics of atomic structure and isotopes of elements. This is a modified worksheet that compliments the modified assessment. Our universe is made up of many different elements. This inquiry card will allows students to explore som... (more)e of the common elements that make up our universe. 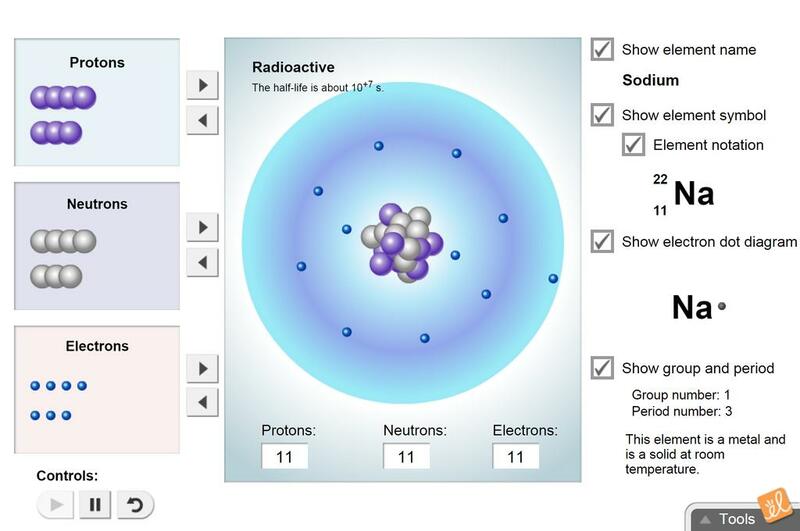 I use this activity to help students to learn why ions have the charge they have. It also moves into why... (more) certain atoms behave the way they do in terms of how many electrons they will gain or lose. A simple worksheet to guide basic exploration of The Element Builder. Designed as an introduction to elem... (more)ents for 5th Grade. A modification of the exploration guide to match the New Brunswick curriculum guide. This activity helps to lead students to understand that the number of protons alone affects the identity ... (more)of an element. It also helps develop the concept of mass number as beign the number of protons and neutrons excluding electrons. Students discover what the numbers around the symbol mean by experimenting. I found some interesting videos online on the historic development of the atomic theory. I came up with a... (more) simple worksheet with 12 questions for students to answer as they work watch the different videos. Worked really well for introducing atomic structure and also the concept of valence electrons. Very engaging and causes the students to ask deeper questions. This is fantastic for helping your students to grasp the concept that the number of protons gives an element its identity. This Gizmo is good both as an introduction and for review. This is a great Gizmo for helping students understand matter and atoms. They really understood how protons change the element. Great way to make an abstract idea concrete for students. Helped my students fully understand amounts of electrons on each shell and how many electrons can be on each shell.